We haven’t posted in the last days because we were busy running around, asking for approvals to film in certain places. Since we won’t be able to film in some of them, we wanted to give you a heads up on what we all lost. Here, in our city, there is a beautiful Lutheran Cemetery. It’s absolutely gorgeous, like taken from another world where Tim Burton was the gardener. Just look at how beautiful it looks… and this is all WITHOUT filters or fancy post-production stuff. You can easily imagine how we fell in love with the place. We had to shot a dialogue scene here and, for the mood setting, it was perfect. Unfortunately, we’ve got an official “back off” so we have to film in an ordinary cemetery. I’ll never understand why people just say “No” if they’re not getting money out of it. For this one… we didn’t even get a reply. We’ll try again but we doubt people will help us. If we don’t get a response, we’ll just have to find someplace else to film. Pity… we’ve got so many awesome things around here that would help the Tourism …yet we don’t exploit them at all. Oh and that’s also the main reason for us postponing some filming… we can’t film without written approvals and I refuse to mess up the Plustard Series with ugly/boring backdrops. We love the characters too much to do that to them. Aww, man, it is such a shame about the cemetery. Maybe they suspected that you might vandalise it? This place is so good that I would suggest you to ask them again, and make your intentions clear. Or maybe you can use green screen with this cemetary? We can film at the arc without approval.been there,done that. I think you could film in Bellu, it’s not as impressive, but still monumental. We tried and we were refused. 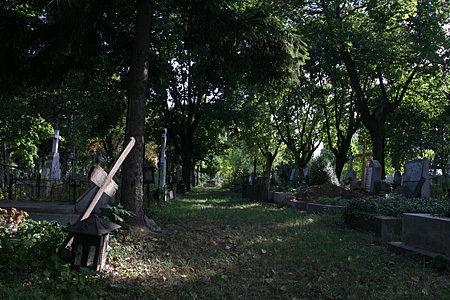 We tried several cemeteries in Bucharest, including the Lutheran one which is beautiful… and we were not allowed.